AbsentPage is a smasher from Minnesota who is known for being one of the quickest improving Melee and Project M players in his state, earning the #1 spot only a year and a half after his first tournament. He is also known for being extremely technical, fast, and having a creative punish game. He is the best Fox in the Midwest, and has taken sets off of top players such as S2J, Crush, Swedish Delight, Duck, lloD, and many other top professionals. AbsentPage is currently ranked 1st on both the Minnesota Melee and Project M Power Rankings and 24th on the 2018 MPGR. He was signed by PNDA Gaming in 2015. On July 21st, 2017, he left PNDA Gaming. On January 6th, 2018, he signed with Coalition Gaming. His work ethic towards overall improvement has been compared to that of Mew2King, being mentioned by publications and community members alike. This was exemplified by a tweet from Vro at Combo Breaker 2018. 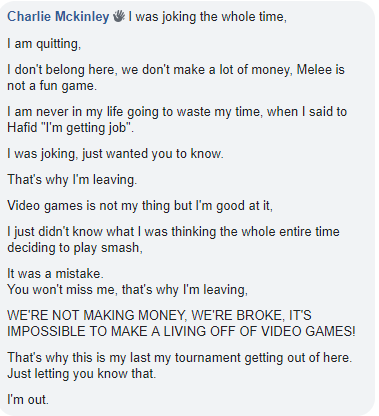 His manager reported that he had retired from Melee on March 27th, 2019 , however he announced that he was returning to Melee later that same day. After a series of controversial tweets about Mew2King on April 5th, 2019, which resulted in his ban from Minnesota Smash events, he announced that he was quitting Smash. AbsentPage is one of the stronger foxes to exhibit a more defensive playstyle. He notably plays very grounded, and has a very strong dash-dance game which he uses to often find grabs and running shines, the two core openers to his very strong punish game. His grounded spacing and positioning is very strong, allowing him to effectively respond to an opponent's offensive options with moves like up-tilt and to tech chase efficiently after a knockdown. Generally speaking, AbsentPage is one of the better tech-chasers with Fox, allowing him often outpunish his opponents after sometimes rather scrappy neutral exchanges (for example, vs Rik at Full Bloom 4). However, his rather cautious neutral game can serve to his detriment, with losses to players like Fiction who play using more fulljumps and with a similarly calculated style. Additionally, his occasional use of character like Sheik and Marth can lead to inadvisable counterpicking decisions. Entering his first tournament in August of 2014, AbsentPage quickly began grinding, and his desire to improve paid dividends early on - winning his first tournament within 6 months (over local legend and one of the best kirby players ever, Triple R). Shortly after, he was ranked on the April 2015 Power Rankings at 6th, and continued to attend tournaments regularly. Originally a Sheik main, he added Fox to his repertoire, and by the next power ranking in August 2015, he was ranked 5th behind all of Minnesota's old guard; Slayer, Chexr and Triple R. By January of 2016, having placed solidly at 9th in his first regional competition - Kings of the North 4 - he was finally ranked in the top 3 on the Minnesota Power Ranking, only behind Chexr and Slayer. Finally, in April of 2016, after only competing for roughly a year and a half, AbsentPage was ranked 1st, dethroning Slayer after 2 years of dominance over the scene, and cementing his place as one of the top players in the Midwest. In his first ever Major level tournament at Smash 'N' Splash 2, AbsentPage coasted through pools until he reached Winner's Qualifier for Top 32, where he was 2-0'd by Hungrybox. In the first round of Losers, he defeated Drephen 2-0, before being eliminated by Darkatma to place 17th. Attempting to defend his region at Push More Buttons, AbsentPage advanced into Winners side of Top 8, beating Slayer 3-1, was sent into Losers by Kels in a close 3-2 set, and then finished 3rd after losing to ORLY (3-1). This was followed by a lukewarm 97th place finish at The Big House 6, where he dropped a close 2-1 set against Kage, before being eliminated in Round 2 Pools against Iceman (2-0). At Kings of the North V, he showed promise after being sent to Losers by Drephen in Top 64, then beating Sago to get into Top 8, where he 3-0'd Triple R, avenged his loss against Drephen 3-2, and took his first set against Kels 3-1 in Loser's Semis, and then was eliminated at 3rd by Prince Abu (3-0). In his last Major of 2016, AbsentPage finished strong by earning 25th at UGC Smash Open, besting veteran Phil (2-0), and losing out against Hungrybox (3-0) and MacD (3-1). At his first Genesis (GENESIS 4), AbsentPage lost to Nintendude 2-0 in Round 2 Pools, and then beat Crunch (2-1) and G$ (2-0) before being eliminated by Amsah to finish right outside of Top 64. He repeated a 17th place finish at Smash 'N' Splash 3, taking out Trulliam to progress into Winners side of Top 64, where he met Plup (losing 3-0), and then beat Michael and Vro, then lost to n0ne in Losers Round 4. His true breakout performance was at EVO 2017, where he beat Lovage 2-0 to make it out of Round 1 Pools, and then ran through lloD and KJH, losing out to Plup once again - this time in Winners Finals of Round 2 Pools. In Top 48, he beat Eddy Mexico 2-0, but was eliminated by aMSa to finish 25th. At Shine 2017, he had a decent 49th place finish, thanks in part to some upsets early on in pools. He was defeated by Mike Haze 2-0, and then was eliminated by SFAT 3-0 to place 49th. His last Major of the year ended with a solid 33rd place finish at GameTyrant Expo 2017, where he was beaten by MacD in Round 1 Pools, and then lost a close 3-2 set against Crush. A hattrick of regional events capped off the year; Super Rubicon 2 (4th), House of Paign 15 (3rd) and The Winter Theater (3rd), where AbsentPage took sets from Prince Abu, Michael, and Reeve. The attendance he showed earlier on in his career finally managed to crossover to his regional and national presence, and AbsentPage was ranked 74th on the 2017 SSBMRank. Kicking off the year at GENESIS 5, AbsentPage beat L (2-0) before losing to SFAT (2-0) in Round 2 Pools. He then lost a close 3-2 set against Laudandus to finish 65th; a repeat of last years placement. His next significant tournament would be Full Bloom 4, where he lost to Ginger in Round 1 Pools, and then went on a tear in Losers side of Top 48; beating Ryan Ford (3-2), Gahtzu (3-2), lloD (3-2) and Rik (3-1), only losing out to aMSa to place 9th. He then won his first regional tournament - House of Paign 17 - double eliminating Fiction, picking up a win against Zamu along the way. The next tournament was one that he was invited to after being ranked in the top-100, Fight Pitt 8. Here, AbsentPage was sent to Losers side of Top 48 by Santi (3-1), and then beat Junebug (3-1) before rematching Santi for 4th place, losing 3-2. This was followed by a pair of regionals on the east coast, GEMINI and The Scarlet Classic, where AbsentPage finished 4th and 2nd respectively, taking sets from Darktooth, La Luna, Swedish Delight, Rishi and Crush. He quickly returned to Champaign for House of Paign 18, beating Crush again, 3-0ing Ginger and KJH, and beat KJH again to take 1st. AbsentPage flew out the next day to attend Super Smash Sundays #64, losing to Captain Faceroll (2-1) and Lucky (2-1). He defended his region at Push More Buttons 2018, beating Kage and Spark (twice) to win the event. At Combo Breaker 2018, he was sent to Losers of Top 24 by KJH, and then took out marquee attendees S2J (3-2) and Duck (3-0), before falling to Swedish Delight (3-1) in Losers Final to finish 3rd. The 'summer of smash' began with Smash 'N' Splash 4. Ben upset AbsentPage in Round 2 Pools, before AbsentPage avenged this loss to make Losers side of Top 64, where he took out Android (3-1) and Rocky (3-2) en-route to a 17th place finish after losing to HugS, 3-1. The following weekend, he attended OpTic Arena in Texas, losing to S2J (3-1) in Winners side of Top 8, and then tearing through Losers once again, this time defeating Gahtzu (3-0), Uncle Mojo (3-1), Bananas (3-2), and then was eliminated by Wizzrobe (3-1), taking 3rd at the event. He also went on to win the doubles bracket with (future teammate) Snowy, beating the other top teams present. This was followed by a 9th place finish at OMEGA II, where he only managed to take one top-100 win against MilkMan (3-1), losing out to Trif and Rishi (both sets being 3-1). At Esports Arizona: Talking Stick Resort 4, AbsentPage had a strong run, beating La Luna (3-2), losing Winners Final against ARMY (3-0). He beat Medz (3-1) in Losers Final, and managed a bracket reset against ARMY, but lost the second set of Grand Finals, earning 2nd place. Finishing a busy June schedule with CEO 2018, he lost to Shroomed in Round 2 Pools, but was DQ'd and finished 33rd (although he was projected to place 17th). After a month-long hiatus from the national scene and being ranked 22nd on the Summer 2018 MPGR, AbsentPage broke into his first Major Top 8 at Low Tier City 6, losing to Hungrybox (3-0) in the Top 8 Winner's qualifier, beating Android (3-0) to make Top 8, and losing to Mang0 (3-0) to finish 7th. He was then upset in Round 2 Pools at EVO 2018, losing to Cactuar (2-0), before beating Spark and being eliminated by Axe, taking 25th. AbsentPage then placed 17th at Super Smash Con 2018, after beating MacD (2-1) and then being sent to Losers side of Round 2 Pools following a close 2-1 loss to KJH. He beat Nintendude (2-0) to make it into Top 32, and then beat Uncle Mojo (3-1) before being eliminated in a game 5 set against Drunksloth. Another trip down to Chicago for AlphaCon 2018 and two locals led to three 1st place finishes just ahead of Shine 2018. A routine run up to Winner's Top 64 qualifier saw him upset by 42nd, and he was able to make it through losers, beating Legend (3-0), before being eliminated at 25th in a game 5 set by Duck (thanks to an upset by Captain Faceroll in Winners side). The last quarter of the year kicked off with Show Me Your Moves 19, a historical regional tournament in Illinois, where he teamed with Prince Abu, winning the event through winners side, only dropping 2 games. In the singles event, he had a strong run through Top 64, beating Michael, KJH and Drephen to make it to Winners side of Grand Finals, but lost both sets to Fiction, taking 2nd place. He then attended The Roast of Hugo Gonzalez, being sent to losers by Westballz, and then eliminated by Fiction to finish 9th. Rounding out the action in September, AbsentPage avenged his EVO loss against Cactuar at Emerald City 7 with a 3-0 victory, double-eliminated FatGoku, but took 2nd place, losing out to Fiction once again. At The Big House 8, he continued to impress in Doubles, placing 4th with Fiction. Beating Moky to make Top 64, he fell 3-1 to Axe. In perhaps his strongest run to date, AbsentPage eliminated Trif, S2J, ChuDat and Gahtzu to make Top 8. A 3-0 loss to Zain ended his run in bracket, where he placing 7th. He then had a rematch with Axe for a position at Smash Summit 7, but lost 3-0. This was followed by a 3rd place finish at The Script - an MD/VA regional featuring the top Falcon players, where he defeated Trif and La Luna. Next was Clutch City Clash, where he double eliminated Cal en-route to a comfortable 1st place finish. Kicking off November, he attended GameTyrant Expo 2018, where he put on a strong showing in doubles, taking 2nd place with Snowy (notably defeating eventual champions, SFAT and Zain in winners finals). Despite this, he managed a sub-par 13th place finish, sent to losers by Zain and dropping a game-5 set against Captain Faceroll. His last tournament in November was DreamHack Atlanta 2018, where he double-eliminated S2J, winning his first National level tournament. This was followed by wins at GopherCon and OUTFOXX'd just ahead of Don't Park on the Grass 2018. Seeded 10th at the last Major of the year, AbsentPage was floated into top 128, playing his second set against Hax, where he lost 3-0, inexplicably going Sheik all three games, despite being proficient in the Fox ditto. He then was eliminated by Ginger to place 17th. AbsentPage kicked off 2019 with a solid 3rd place finish at the premiere edition of Hold That L, a monthly in Chicago. Taking out two top-100 members (NMW and KJH), he lost a close 3-2 set against Duck to take 3rd place, and also won doubles with semi-static teammate, Prince Abu. He then attended GENESIS 6, advancing to top 64, but was DQ'd and placed 33rd. The following weekend, he attended EnCircle CoMo Gaming Expo (a regional charity event in Missouri), where he swept the winners bracket without dropping a game. The following weekend, he placed 3rd at The Script 2, the second iteration of the MD/VA regional that focuses on specific characters. Taking out Junebug and iBDW, he lost in winners finals to Zain and was eliminated in losers finals by Ginger. Afterwards, AbsentPage won Hold That L 2, double eliminating Moky (including a double 4-stock in Grands), and then flew out the following morning to attend Fight For Socal 3, where he earned a win against Squid, but placed 5th, losing to Westballz and SFAT. The next weekend, he attended House of Paign 20, and took 3rd place, besting Rik, Prince Abu and Hax, but was double-eliminated by Ginger. Keeping busy, AbsentPage then attended The Gang Steals the Script in Pennsylvania, and advanced to winner's semis against Swedish Delight, dropping a game 5 last-stock set, but took out Kalvar and Jerry in losers to face Swedish in loser's finals, but was eliminated again to take 3rd place. *AbsentPage was poised to play doubles with Amsah at Super Smash Con 2018, however complications with getting to the venue resulted in them not entering together. Amsah, in dismay, later tweeted about it. AbsentPage received his gamertag from the Xbox Live random name generator. He has said that he was inspired by Mew2King, Hax and Dark. Having begun playing competitively in August of 2014, he first appeared on the Minnesota Power Rankings in April of 2015 (ranked 6th) - only 8 months after attending his first tournament. AbsentPage has managed to repeat his placements at certain majors: 17th at Smash 'N' Splash (2016-2018) and 25th at EVO (2017-2018). Is AbsentPage a Top 30 Player? ↑ Coalition Gaming Signs 2017's 74th Best Player. ↑ Monday Morning Marth: 4/2. ↑ Monday Morning Marth: 4/16. ↑ KJH shines at Combo Breaker 2018. ↑ Super Smash Bros Weekend Recap Momocon 2018 and Combo Breaker 2018. ↑ Event Spotlight: Omega II. ↑ Recap: Combo Breaker 2018. ↑ AbsentPage takes Tri-State by storm in Super Smash Bros. Melee. ↑ Interview With Lucky: Smash 'N' Splash 4. ↑ Dialogue with Axe: Pikachu is overrated, Dr. Mario and GW are underrated. ↑ At The Script Episode 1: Race to the Finish, n0ne outpaces the field. This page was last edited on April 20, 2019, at 05:28.